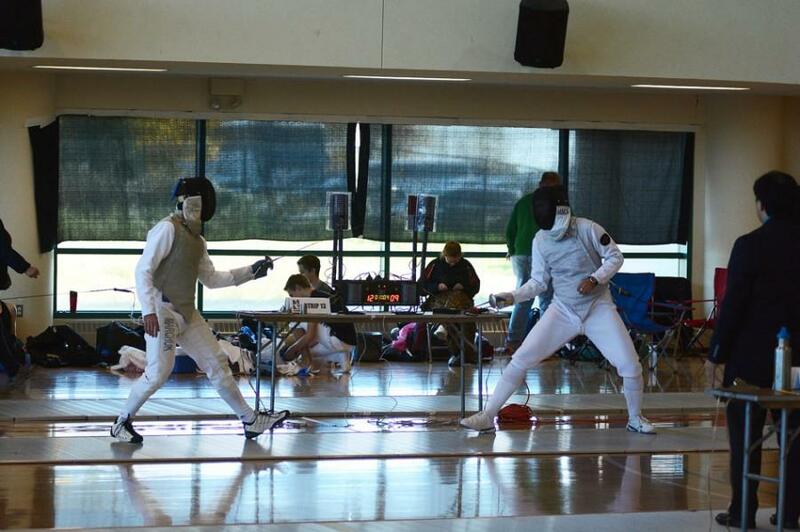 Two fencers square off in a dual meet earlier this season. The Wildcats struggled with an alternate scoring format this weekend, falling to the Fighting Irish 60-45. Football wasn’t the only Northwestern team in South Bend, Indiana this weekend — fencing also traveled to Notre Dame for an exhibition event against the Fighting Irish. But unlike coach Pat Fitzgerald’s squad, the fencers couldn’t shock the world with an upset, falling short 60-45. In fact, the outing looks even more impressive for the Wildcats considering the scoring system. In the scrimmage set up between the two schools, they followed a modified version of the USA Fencing relay format rather than the dual meet system. In USA Fencing events, fencers are paired, with each duo squaring off until one team reaches five touches or time runs out. Scores are cumulative, and this continues with the next pair until someone reaches 10, and so on until 45. But because it’s just epee or foil in the international competitions, NU and Notre Dame changed the rules so that all three weapons could compete. There was not a rotation of fencers, as in USA Fencing, but four bouts in each of the three weapons, meaning the first team to 60 touches would come away victorious. A dual meet is only to 27 points, and each competitor can only fence three bouts. That means the most any individual fencer can score is 3 points. In the relay format, Kiefer racked up 15 points alone. Kiefer not only finished sixth at the 2012 Olympics, but she was also the silver medalist at the 2011 Junior World Championships and Cadet World Championships, the gold medalist at the 2012 North American Cup and the 2013 NCAA Foil Champion. The teams flipped a coin to decide which squad would go first: epee, foil or sabre. Notre Dame won and chose epee. Schiller then went second, picking foil and leaving sabre for last. Heading into the eighth bout — Kiefer’s bout — the score was tied 25 apiece. With the foils going until one team reached 40, Kiefer picked up 15 touches versus NU junior Charlotte Sands’ three. “There wasn’t anybody on my team that could keep up with someone as strong as that,” Schiller said. Schiller said if he had his druthers, foil would have gone first. At the eighth bout, tied 25-25, Kiefer was able to to run the score up to 40. If she had been the fourth bout as Schiller hoped, she could only score up to 20, so she likely would not have had the opportunity to score as many points. If you take Kiefer’s rounds out, the score is much closer: 45-42 Notre Dame. Because of this, Schiller views this scrimmage as an incredibly successful one for the team.